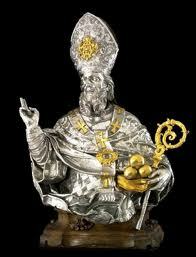 Saint Nicholas was a 3rd to 4th century bishop saint, Greek by birth and active in the Middle East. He was of a wealthy family but orphaned and raised by an uncle. He came to the priesthood comfortably (no towers or evil parents or prostitutes or lightning) and progressed to bishop status in good time. Nicholas is remarkable for the large number of miracles he is supposed to have worked during his lifetime, and for that reason is a very popular saint to pray to, since he is obviously willing to use the powers all saints have. He saved ships from storms, multiplied grain to save towns from famine, and resurrected three kids. Nicholas’ most famous story involves, not a miracle, but generosity. It has several variants, but all revolve around a poor man in the town who had three daughters but did not have enough money to give them dowries so they could marry. Nicholas stealthily provided the money, which is most commonly said to have been three bags of gold coins, but it varies. He did it on three successive visits (either three days or three years), each time tossing the money secretly into the house so the father never knew his benefactor. On the last visit (predictable due to the regularity of the first two), the father lay in wait, hoping to spot and thank his mysterious benefactor. The ending varies, but in one popular version Nicholas, realizing the man was watching the window, climbed across the roof and dropped the gold down the chimney. Some versions add the detail that one of the daughters had left her stockings hung up to dry by the hearth, and the money fell into one. He is also supposed to have given other charitable gifts, including leaving coins in the shoes of those who left them out for him. Saint Nicholas multiplies grain, so sailors can give some to end a famine and still have enough to deliver. In 1071, when the area where Nicholas was buried fell into non-Christian hands, the relics were removed to the Italian town of Bari, sparking his large Italian cult. Some Venetians claimed to have a big chunk, spawning another major church to him in Venice (where a patron of sailors was very popular) but scientists and their x-rays have confirmed that the remains at Bari are mostly intact. Nicholas’ relics excrete a rose-scented liquid substance, referred to as myrrh, which has healing properties, much like the substance produced by the remains of Catherine of Alexandria. Bishop saints are tricky to identify in art. 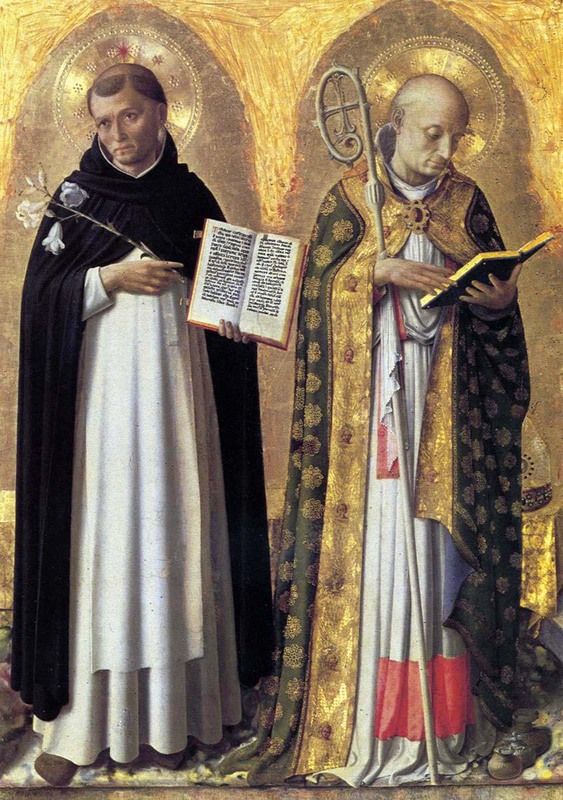 They’re easy to tell from other saints, with their curved shephard’s-crook-shaped miters, their pointy, triangular bishop hats (not to be confused with the cone-shaped pope hats with three crowns on them), and their fancy robes, with a cloak with elaborate trim closed by a broach at the breast, and, frequently, gloves with gems on the back of the hand. Yet they can be very difficult to tell one from another, because their attributes are often unclear, or omitted. How can we be expected to tell them apart if they have no identifying attributes? 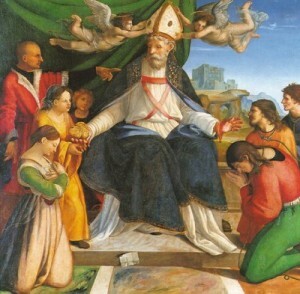 Often the original context of the painting would make it clear, since it would be commissioned by or for devotees of a particular bishop saint, or in a city where a specific one was most popular. But since pieces are so often in museums now, sometimes all one can do is guess. Nicholas was one of the most popular bishop saints, along with Augustine and, in Florence, Zenobius, so in general Nicholas is a safe guess. When in doubt, the artist sometimes provides separate scenes as hints. 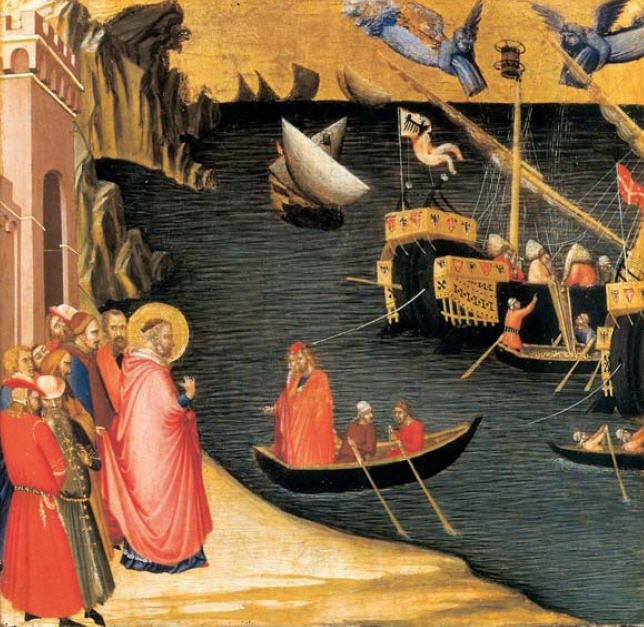 Sometimes these are painted on separate panels below or above the main painting, showing a recognizable scene from the saint’s life. With bishop saints, sometimes scenes from their lives are embroidered on their robes, though this can be deceptive, since I’ve seen Saint Augustine with scenes from the life of Saint Stephen on his robe. 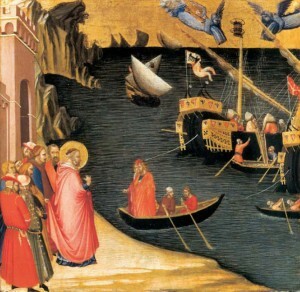 As for Nicholas specifically in art, three golden balls or golden coins or bags of gold are the clearest sign, or a bishop accompanied by ships or standing near the sea. Beyond that, though, Nicholas is a decent generic guess if you don’t have a better clue for your unidentified bishop. Since Saint Nicholas is not, in fact, a jolly, red-clad toymaker equipped with flying reindeer, someone else has to bring presents to the kids in Italy. This office falls to La Befana the Christmas Witch, or more accurately the Epiphany Witch, who flies on her broomstick with her sack of toys bringing presents to all the children on Epiphany Eve (Jan 5th). 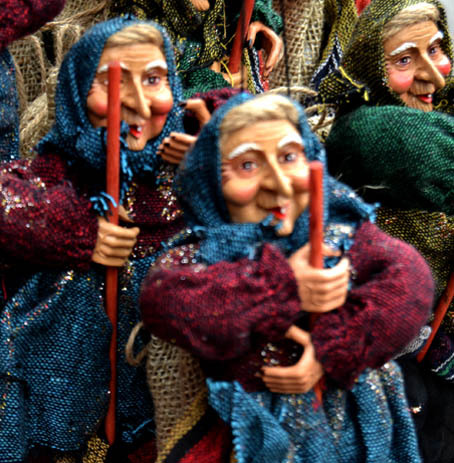 She looks like a witch in every classic sense, so Christmas fairs in Italy are packed with witches and Christmas decorations often look more like Halloween than Christmas to American eyes. 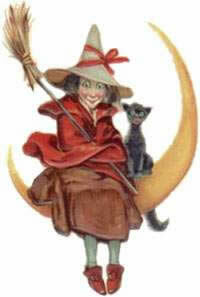 If you ask Wikipedia about La Befana it will tell you various origin myths. She was hostess to the Three Wise Men on their way to the Nativity; she regretted not following them and is still looking for the Christ Child so visits all children; she had a child which died so Christ let her be Mom to every kid in Italy; she’s the Sabine goddess Strina. 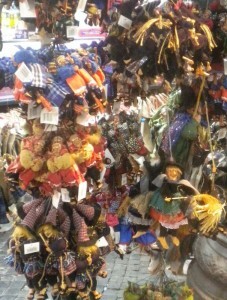 La Befana ornaments crowd for space at a stall in Piazza Navona, Rome. If you ask an Italian, in my experience you don’t get any of that. 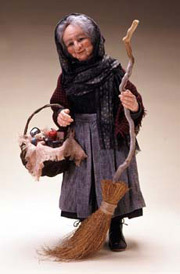 La Befana is a part of the holiday tradition, unquestioned as Santa in areas where he’s the gift giver, so just as most of those in the Santa region can’t tell you much about Nicholas of Bari, Italians are content with the witch they’ve known since childhood and don’t seem to wonder much. I have to say, though, Italian kids have more excuse to freak out at shopping malls when parents set them in the lap of someone costumed as the Christmas gift-giver. A witch! Why are my parents handing me to a witch? 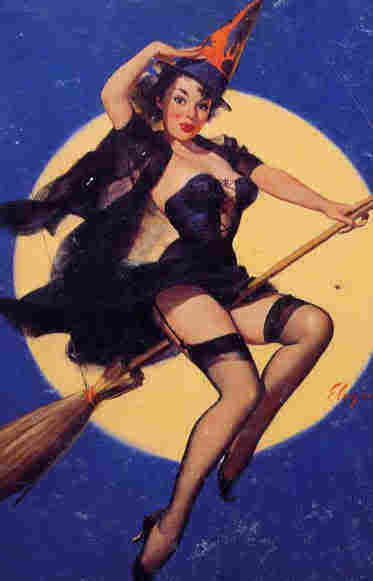 So this year, if you’re the tree-trimming type, get out your broomsticks and pointy hats and have a nice witch-filled Italian Holiday!